Corfu is the emerald isle of the Ionian Sea, where there is an enormous choice of land and property, including luxury villas, holiday hideaways, permanent homes and commercial investments – a range to suit every budget, in all areas. Although the island is not large, it’s hugely varied, offering a wealth of views, terrains and climates. You can breakfast on your balcony overlooking the sea, lunch on top of the mountain among the olive groves, and have pre-dinner drinks watching the sunset on the beach. All within just a few minute's drive! Apart from it’s obvious appeal, on a practical level Corfu is a great ‘living’ choice – nowhere is far away from a beach, taverna or shops, plus Corfu Town offers Venetian architecture, museums, shopping and atmosphere. Flights are frequent from all over Europe - including Russia - and flight times are short. Plus the airport is no more than an hour from even the most distant parts of the island. Corfu really does offer something for everyone – spectacular sandy beaches, rock bathing, fishing harbours, turquoise sea and stunningly beautiful views. The locals welcome all nationalities, both as visitors or permanent residents, and many speak several languages. Add to this ease of access, an incredibly low crime rate and an enviable climate and it’s hard to think of a better choice for an overseas property. "Corfu is almost two different islands, one in the summer, and one in the winter, and both appealing in their own way." There is a wide range of travel options when you plan your journey to buy property in Corfu, including scheduled and charter flights, domestic and international ferries. Please do not hesitate to contact us if you would like advice before booking flights, hotels, ferries, car rental, etc. We will be only too happy to help. Our experience means that we are ideally placed to assist you with recommendations for virtually any service you are likely to require, whether for your trip or for your stay in Corfu. During the summer months there are direct charter flights from many parts of Europe, the Balkans and eastern Europe. In addition, Easyjet offers regular scheduled flights from London, Bristol, Manchester, Berlin and Milan. Ryanair also fly twice weekly from Stansted and Monarch have a scheduled service three times a week from Gatwick. Wizz Air offer cheap summer flights from Budapest and Warsaw. Access to Paxos is either by a combination of flights to Corfu and then the regular ferry or Flying Dolphin services from Corfu, or by ferry from Igoumenitsa. During the winter, flying to and from Corfu is via Athens or Thessaloniki with daily scheduled flights from Olympic Air, Aegean Airlines, British Airways and Easyjet. Alternatively, Ryanair fly regularly from London to Brindisi, Bari, Ancona and Venice, all of which are just a ferry ride from Corfu. If you are planning to arrive by car the main ferry operators have routes from Italy to Corfu and mainland Greece. Corfu has a large number of hotels to suit any budget. Choosing and booking online has never been easier. However, in the winter months it's difficult to find any outside Corfu Town that are still open. We are always happy to describe hotels either over the telephone or by email, so that your choice is likely to suit your taste and budget. We have many years of experience with luxury villa rentals, so if you would like to rent a villa or a smaller apartment in Corfu while you look for property, do let us know and we will make some recommendations. 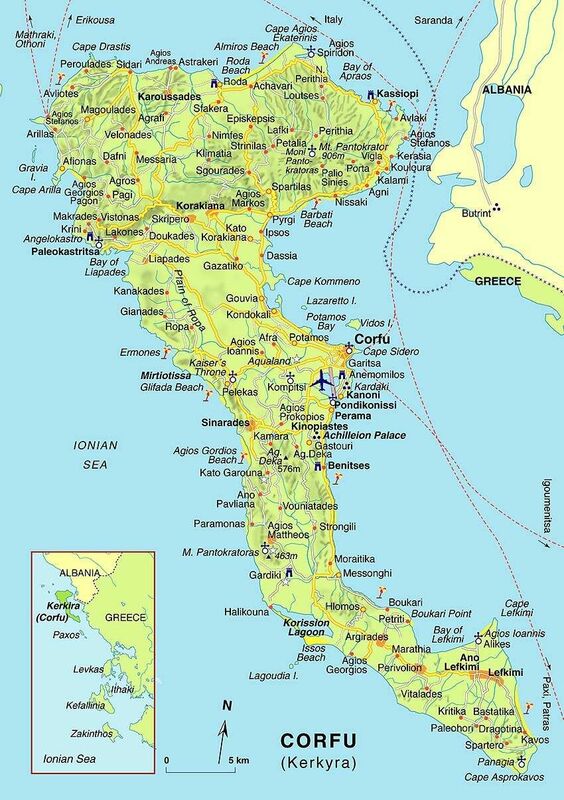 For car rental whilst you are in Corfu we would recommend corfucarhiredassia.comfor economical new vehicles. Please ask for assistance and advice. We have arrived and departed from Corfu (mostly from the UK) more times than we care to remember and are always happy to pass on any hints and tips that we have picked up over the years. "On windy days, it's best to swim on the calmer east coast. Sand lovers should head for the north and west coasts, while the east coast is best for fans of pebbly beaches in small bays." Corfu town is one of the prettiest towns in the Mediterranean. A mixture of Italian, French and British influences combine to make the town unique in Greece, almost a half-way-house between the East and the West. The old town, which runs between two ancient fortresses, along the sea coast and inland in a maze of cobbled streets and steep steps, has been granted UNESCO World Heritage status, and is full of delights for the visitor and resident alike. There are myriad churches, squares and alleyways to explore, the famous esplanade - Liston - modeled on the Rue de Rivoli - is famous for its coffee shops and restaurants where you can sit and watch the world go by. In the summer the wide pavements and adjoining park are thronged with visitors, and in winter the locals congregate here to exchange news and views and gossip while their children play. In the evenings as the dusk falls and the house martins whirl and swirl amongst the rooftops, groups of teenagers gather to pass the time on their way to and from extra lessons or music practice. Totally Mediterranean in this respect, Corfiots live their lives outside and the climate encourages the visitor to join in and pretend to be Greek. There are many top quality restaurants serving a wide variety of local specialities and dishes from other countries as well as smaller local tavernas, intimate bars, coffee and cake shops. The town is the centre of island life not only because of its many shops, but because it is here that you will find doctors, banks, accountants and all the essentials for daily living. Ferry boats to and from the mainland ply the narrow straits - it takes just 1.5 hours to reach the Greek port of Igoumenitsa which then connects with various mainland locations via wide and largely empty motorways. Cruise ships regularly dock and unload their passengers to explore the island, and the airport is located on the edge of the town. "In Corfu Town, you really must try the spinach or cream (bougatsa) pies from Thessalonikos just off SanRocco square. Have lunch in one of the tiny back street restaurants too, then do a bit of people watching on the Liston!" Acharavi has everything you need! There are a couple of large supermarkets and lovely bakeries, lots of nice cafes and tavernas which are open all year round. The town has a good primary school and is served by a good bus route to Corfu Town. Just a short drive away is the picturesque town and beaches of the North East coastline, famous for their clear waters and beautiful scenery. Just a few kilometres inland from the sandy beaches of Astrakeri and Agnos on the north coast, Karoussades is one of the largest villages in the area. The village has a bakery, mini market, post office, doctor’s surgery and a police station! The Karoussades philharmonic band regularly participate in concerts in Corfu and the rest of Greece. Perithia is located just off the main road linking Kassiopi with the towns on the north coast of the island. The village has a couple of tavernas, two mini markets and a post office. The historical village of Old Perithia is a short drive up the mountain, famous for its beautiful derelict houses and home to some fantastic traditional tavernas. It is the perfect location for keen walkers as there are many scenic routes along the coast and up the mountain of Pantokrator. Once a small fishing village, Sidari is now a popular resort with a long sandy beach and all types of facilities. A short distance away is the pretty village of Peroulades, possibly the best location on the island to watch the sun set. Spartilas is located on the hillside of mount Pantokrator with stunning panoramic views across the island and Albania. The village has a small primary school, mini market, post office, a couple of cafes and tavernas, as well as a successful football team and fantastic choir! The first of the two “Korakianas”, Kato Korakiana (meaning lower Korakiana) has doubled in size over the past years due to its great location and amenities – only 2km from the nearest beach, just a short drive away from Corfu Town and served by an excellent bus route, the village has a mini market, a few great tavernas, cafes and grill rooms and a fantastic primary school. The second “Korakiana”, Ano (upper) Korakiana is spread out across the mountainside with great views across the valley and to Corfu Town. This lively village is home to one of Corfu’s oldest philharmonic bands, thus having a rich cultural history. Scattered across the village you will find a couple of small shops and bakeries, as well as a few little cafes which both locals and visitors frequent at. There are a couple of good primary schools not far away, in Kato Korakiana and Agios Markos, as well as a good bus service into Corfu Town from Ipsos. "We love driving around the island but there are some drives we always look forward to such as the thrilling road from Sokraki to Ano Korakiana." Ipsos beach is approximately 3.5km long, with restaurants, cafes, bars and a few large supermarkets on one side of the road and the beach on the other. Directly behind Ipsos is the hamlet of Agios Markos where there is a doctor’s surgery and primary school. The blue buses connect Ipsos with Corfu Town on a regular basis, and green buses carry on further up the north of the island towards Kassiopi. Located on the main coastal road linking Corfu Town with the North East coast of Corfu, Dassia has a long pebbly beach which can be reached via several little roads. Along the main stretch are many restaurants and café bars, a couple of mini markets and doctor’s surgery, as well as the Corfuhomefinders office! The blue buses run from here to Corfu Town on a regular basis. Barbati beach is one of the longest pebbly beaches on the north east coastline, with several beach tavernas and bars, boat hire and watersports. The village itself is behind the beach and has a few mini markets, a couple of bakeries and restaurants with excellent views up the coast. "Corfu is all about the beach and we all have our favourites. I adore Barbati beach, with its incredibly clear blue water." Nissaki is located along the north east coast road, the centre of this small village being a beautiful old church. Nissaki beach is picturesque, with a small harbour to one side, taverna in the middle and tiny beach on the other side. The beaches of Kaminaki and Krouzeri are just a short drive away. In the hills above Nissaki are the hamlets of Apolisies, Katavolos and Viglatsouri, boasting some beautiful old houses as well as beautiful new villas, many of which are used as holiday rentals. Porta is the largest of several small villages clustered together in the mountains above the north east coastline. Each village has stunning panoramic views out to sea, from some of them Corfu Town can be seen in a distance. This is “real Corfu”, the villages have remained relatively untouched, properties here mainly being small, stone houses with a traditional feel. Walks in the area are fantastic seen as the countryside there is virtually untouched and the scenery spectacular. One of the most famous bays in Corfu, home to some the best sea side tavernas on the north east coastline. Agni is a hotspot during the summer, visitors arriving mainly by boat for a swim and lunch by the sea. The village of Kendroma above Agni bay is a small traditional village with stunning views out to sea and across to Corfu Town. Kalami has one of those stunning calm blue bays for which Corfu is famous. The village is centred around the beach, with many high end villas set on the surrounding hillside, looking out on the spectacular views, and the White House on the seafront was once the home of the author Lawrence Durrell. Once a tiny fishing port, San Stefano is now an extremely well known village, with many prestigious properties located in the hills overlooking the bay. There is a small beach, with several popular restaurants renowned for fresh fish and the area offers some of the most beautiful scenery in Corfu. One of the most sought after areas on the north east coast, Kassiopi is pretty harbour town with a large selection of shops, restaurants and cafes. There are many lovely villas built in the hills around the town with stunning views across the bays and the Albanian mountains. Kassiopi has a few small rocky beaches, as well as the large beach of Imerolia. Located in the hills on the north west coast of Corfu, Magoulades is one of the largest villages in the area with a traditional Corfiot feel to it. The little square has a small café and family run taverna, as well as a mini market. The village boasts some of the oldest and most stunning churches of the island, some of them dating back to the 10th century. Agios Georgios on the north west coast is a resort with a long sandy beach and shallow waters. The beaches of Arillas and Agios Stephanos are just a short drive away, both with similar long sandy beaches and a selection of shops, bars and restaurants. The picturesque village of Afionas is a few kilometres away with stunning views across Agios Georgios bay and some fantastic walking routes. The village with the best view in Corfu! Perched high in the mountain overlooking Paleokastritsa bay and all along the west coast of Corfu, Lakones is one of a kind. There are several restaurants and café bars dotted across the village, as well as a few mini markets. One of the most famous resorts in Corfu which attracts many visitors during the summer months. The two small beaches on either side of the village has some of the clearest water in Corfu, with several restaurants dotted around the bay. In the little hill above the town is the working monastery dedicated to the Virgin Mary, dating back to the 15th century. Gastouri is a traditional village located 10km south of Corfu. Ideal for those wanting to combine being near town yet in the countryside, the village has all the amenities one needs as well as a great philharmonic band! The village has some lovely mansion houses once belonging to wealthy Corfiot families of yesteryear, as well as the famous Achilleion Palace built for the Empress Sissi of Austria. The picturesque village of Pelekas stands on one of the most beautiful hills of the island, boasting breathtaking panoramic views. The village square has a selection of small shops, cafes and restaurants, most of which are open all year round. Just a short drive away are some of the best sandy beaches on the west coast, Pelekas, Glyfada and Agios Gordis. A beautiful village with narrow streets, stunning architecture and old houses with embossed entrances and old churches full of history. The nearby beach of Agios Gordios is the perfect spot for an evening swim and watching the sun go down. Above the beach are the villages of Pentati ,Ano Garouna and Kato Garouna, traditional dwellings with some of the most beautiful views and scenery on the west coast. Located in the centre of the island, just 18km from Corfu Town, Skripero is an attractive village full of history and folklore tradition. Those lucky enough to own a house there enjoy uninterrupted south facing views across the valley, sea views in the distance and sunshine throughout the day. Doukades is a traditional village situated just off the main Paleokastritsa road, just a half an hour drive from Corfu Town. Two very good traditional tavernas are open all year round, as well as a few cafes which locals frequent at. There are some lovely walks through the olive groves which lead to the nearby villages of Liapades and Gardelades. Set high up in the hills with lovely views, Giannades has a very attractive village square overlooking the Ropa valley. The village has a nice, friendly atmosphere and a traditional feel to it. Built on the side of Agii Deka mountain, the village has panoramic views across to Corfu Town and the Albanian mountains. In the village square there are a couple of grill rooms and kafenion (traditional cafes), as well as a small supermarket. Poulades is a small hamlet nestled in the hills in the centre of the island, not too far from Corfu Town to the south and the beaches on the North East coast. The countryside around the village is virtually unspoilt so is perfect for those seeking a tranquil location. Kommeno has doubled in size over the past years, with many large villas being built on the hillside. Not far from the marina in Gouvia and a short drive into Corfu Town it has become a popular choice for locals wanting to live near town yet near the sea. Two of Corfu’s best hotels, the Imperial and the Eva Palace Hotel are located at the edge of Kommeno bay. A conveniently located village, not far from Corfu Town yet surrounded by lovely country side. Being centrally located it is within equal distance from the pebbly beaches on the north coast and sandy beaches on the west coast. Located just off the main north road heading out of town, Gouvia has all the amenities one needs; a couple of large supermarkets, great restaurants and the ever bustling marina! The modern village of Agios Georgios (St. Georges South) stretches along 3km of sandy beach, whilst it’s more traditional neighbour Argyrades, is set up on the hill over looking the sea. Busy in summer with a good choice of shops and tavernas, St. Georges is quiet in winter, but is only a few minutes drive to Lefkiimmi with it’s riverside restaurants and coffee shops, plus several large supermarkets. Agios Matheos is one of the largest villages in Corfu, and even boasts its own football team and philharmonic band. The tiny village streets wind along the mountainside, in between the old stone houses. The main street boasts 2 supermarkets, 2 tavernas, a butchers shop, a grocery, bakery and a Post Office. Only a few minutes drive away from the village is the conservation area of Lake Korission with the amazing beach at Halikouna on one side of the dirt track, and the lake on the other. Well known to fish lovers, Boukari is best known for the traditional fish restaurants on its tiny harbour. Rick Stein cooked his lobsters at a seaside taverna here! The village is approached by the picturesque narrow road which winds along the edge of the sea from Messonghi, with what seems like a taverna round every corner! Halikouna and Lake Korission are becoming increasingly well known as one of the island’s most important conservation regions. The lake is often home to flamingos in spring and autumn, and just a few steps away is the 4km sandy beach, popular with wind and kite surfers. Hidden away in the olive groves, and on the seafront, there are now a number of ‘high end’ villas, many of which are summer rentals. There are 3 tavernas and the nearest shopping is in Agios Matheos, about 10 minutes drive away. Messonghi is both a tourist resort and traditional fishing village - in Messonghi river the tourist boats moor next to the traditional fishing caiques. The village is joined with the larger neighbouring village of Moraitika which has a selection of shops, tavernas and bars open all year. There is also a good bus service to Corfu Town, and the large supermarkets in Lefkimmi are only 15 minutes away. "Always charming and picturesque is the little road winding right on the edge of the sea from Messonghi to Petriti, past little bays with tiny rickety jetties and the fish tavernas." Lefkimmi is Corfu’s second town; the town centre with its narrow streets and small shops seem to be caught in a time warp, although on the outskirts of town are several large supermarkets and stores. A river meanders through the middle with coffee shops and tavernas beside it. 500m away from the town centre is the pretty beach of Bouka with its shallow water and sandy beach. Benitses was originally a small, quiet fishing village; today the new Marina has given a new lease of life to the area, though the older section of the village has retained its original charm. There is an excellent ‘Town’ bus service, and a good selection of shops and restaurants set around the Marina. Paxos and Anti-Paxos are two small islands located to the south of Corfu and connected to it by ferry, speed boat and flying dolphin. Said by many to be like Corfu 50 years ago, Paxos is the sort of place that gets under your skin and you just need to keep going back. It is renowned for its turquoise sea and rugged coastline, picturesque stone seaside villages and its laid-back atmosphere. Popular as a base for sailing holidays. "When I feel like a change of scenery, I take the Flying Dolphin to Paxos, rent a car and potter around the island and its little harbours – it's Corfu in slow motion!"